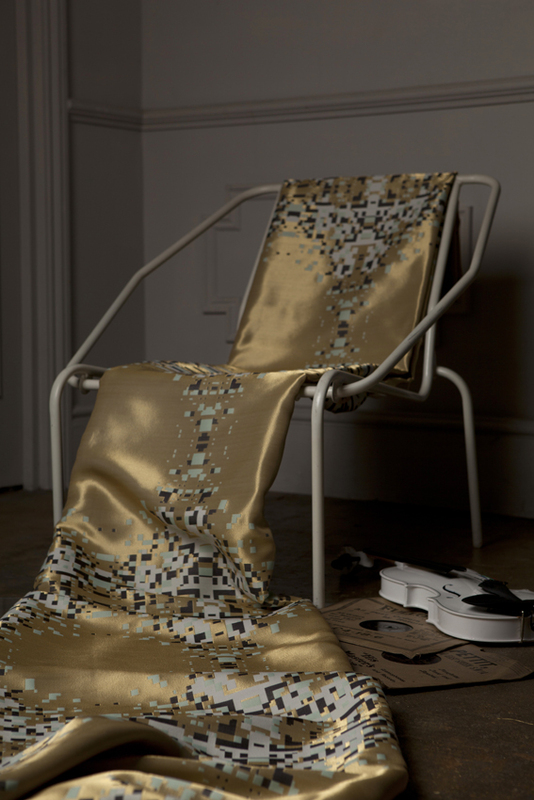 BeatWoven collection created by translating classic British pop music into digital woven patterns. Music becomes fabric for an exciting extension to any music experience. DreaMelody : Patterns in Play. Art fabrics created exclusively for Harrods London, for London Design Week 2014. Through the use of music and song, Nadia-Anne Ricketts of BeatWoven captures the essence of dreams, magic and fantasy by using British iconic pop music 'Lucy in the Sky with Diamonds' by The Beatles, DiamondDaze and 'A Kinda Magic' by Queen, GoldenDaze (The), to translate into its own trademark visual woven patterns. GoldenDaze (The) is available per metre. Woven silk, wool and pure silver metallised yarns.